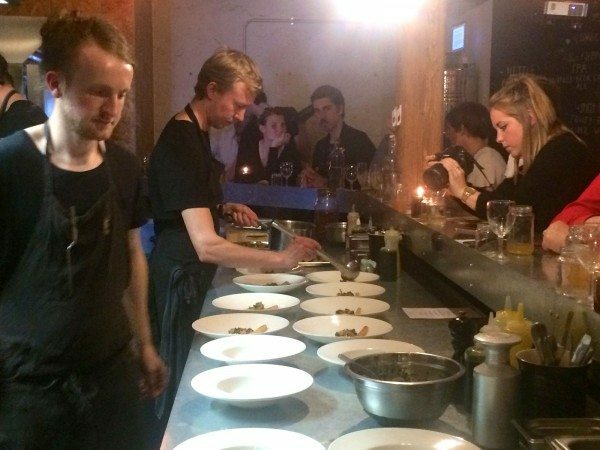 To celebrate a storming first year in business, the team at SILO on Upper Gardner St have launched a delicious new tasting menu available from Tuesday to Saturday evenings from 20 October. 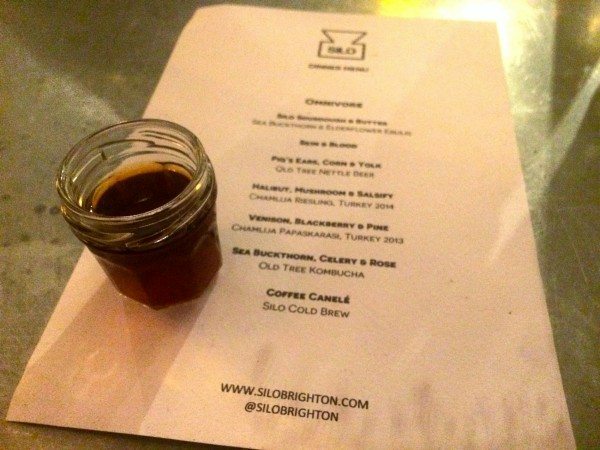 To mark the change in menu and new evening opening hours, RB was lucky to be invited to a special gathering to sample the new menu and hear about the exciting changes taking place at SILO, Brighton’s only zero-waste restaurant. In addition to new dishes, there’s also a new wine list, bar stools for diners right up at the pass so you can watch the chefs in action, as well as a slicker new version of their much-loved small plates made from recycled plastic bags. SILO may well be just a year old, but Head Chef and founder Douglas McMaster is not one for resting on his laurels so it’s all systems go! There are two evening taster menus – Omnivore and Herbivore – and two of us were dining at the launch so we were able to order one of each to try the full range. To start we enjoyed some of SILO’s gorgeous homemade bread with butter churned in-house, with a glass each of refreshing and light sea buckthorn and elderflower ebulis. 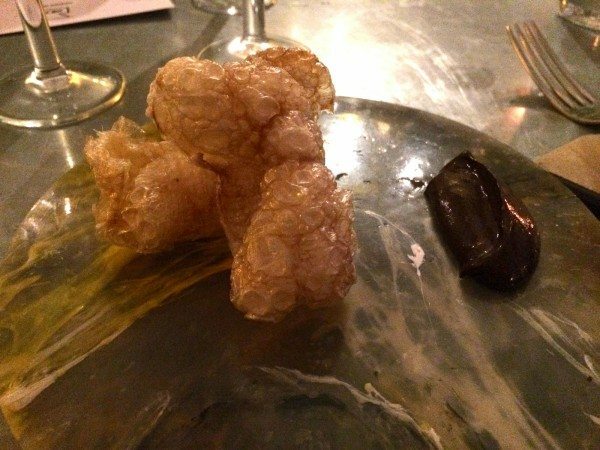 Along came our amuse bouche: for the meat-eaters “skin and blood” comprising pig skin that had been deep-fried until it became light and crunchy, alongside a dark red quenelle of blood emulsion, which was glossy and sweet with a hint of spicing. 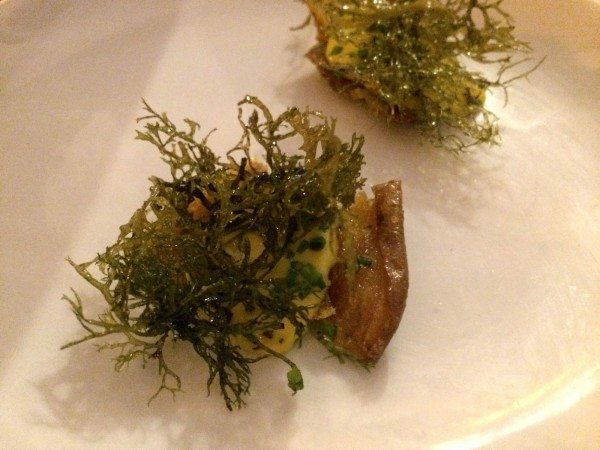 For the herbivores their own version of this – yolk and moss – consisting of a slice of crunchy fried potato skin topped with gooey egg yoke and salty moss. Both were delicious and experimental so an interesting kick-start to our meal. Next up we had “pigs’ ears, corn and yolk” and “Jerusalem artichoke with apple and licorice” both served with Old Tree Nettle Beer. 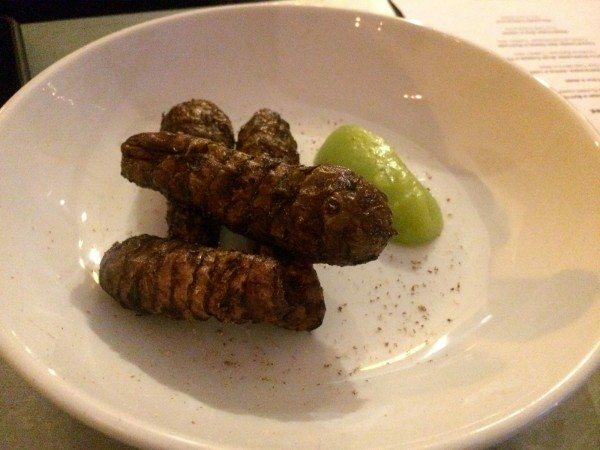 I love Jerusalem artichoke and enjoyed the way it had been prepared – woody stubs crispy on the outside but soft inside, served with a delicate fruity purée. 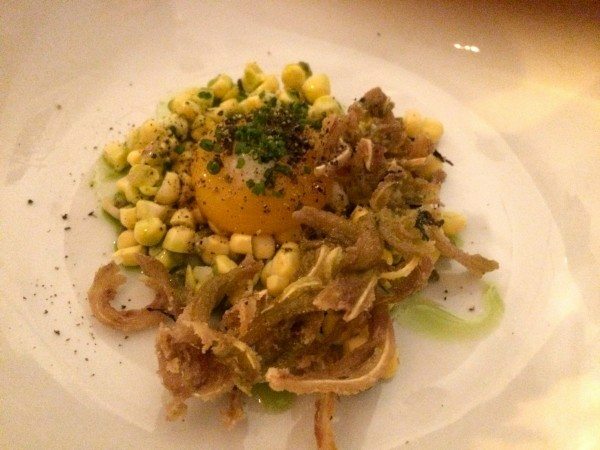 My dish was one of my favourites of the evening – thin strips of crackling pork sitting amid kernels of sweet, al dente fresh corn all bound together with the creamy egg yolk: a surprising and enticing combination of flavours. Halibut was next on the menu for the omnivores, served with pickled mushrooms, salsify and the most incredible broth, while the veggies were given ricotta dumplings with blue cheese and fennel. To accompany that we had a glass of Chamlija Riesling from Turkey which had a very natural and quite robust flavour. Both of these preliminary main courses (we had another one coming along shortly!) were light and fresh – almost spring-like in their vibrancy, which made a refreshing change from the usually heavy autumnal flavours one finds in restaurants this season. 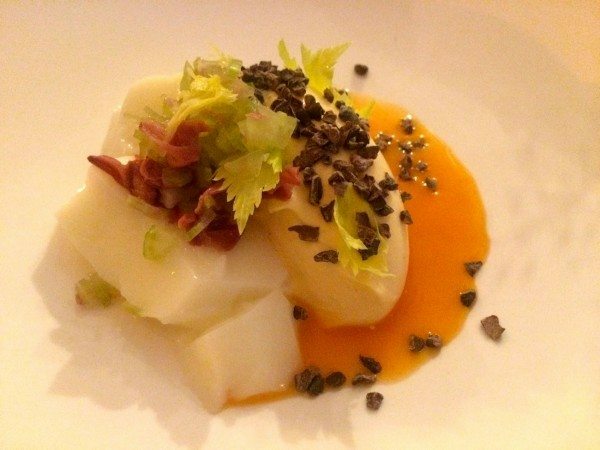 The halibut had been perfectly poached, so was soft and translucent but still holding its own (as halibut does). 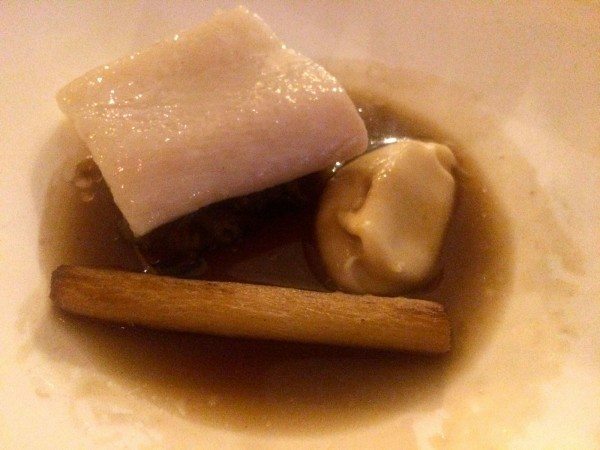 The pickled chanterelles had quite a strong flavour which might not be to everyone’s taste but I enjoyed it – and the mushroom broth was incredible, reminding me of the espresso mushroom broth SILO sometimes serves as a starter. 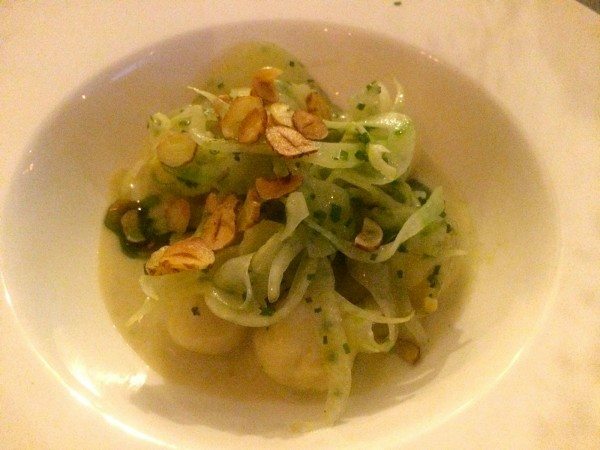 The flavours were big in this dish, which was an interesting contrast to the dumplings in the herbivore menu. More like gnocchi, they were soft and creamy, rich but also light. The blue cheese wasn’t over-powering, and the shaved fennel slices lifted the plate of food to more perfumed heights, which again was an unexpected twist. 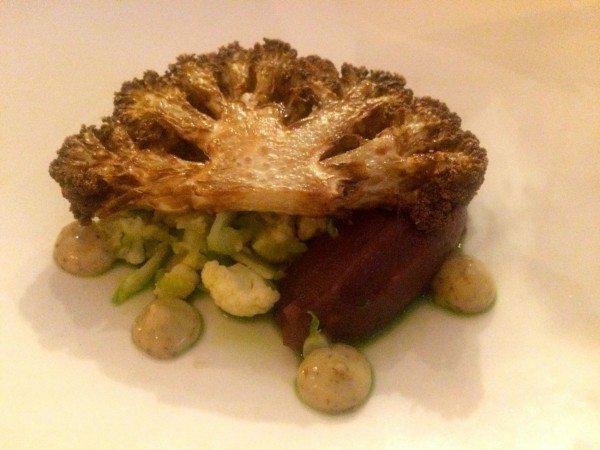 Our next main course on the taster menu was venison with blackberry and pine; plus chargrilled cauliflower with red onion and mustard – both served with a smooth glass of Turkish red Chamlija Papaskarasi wine. 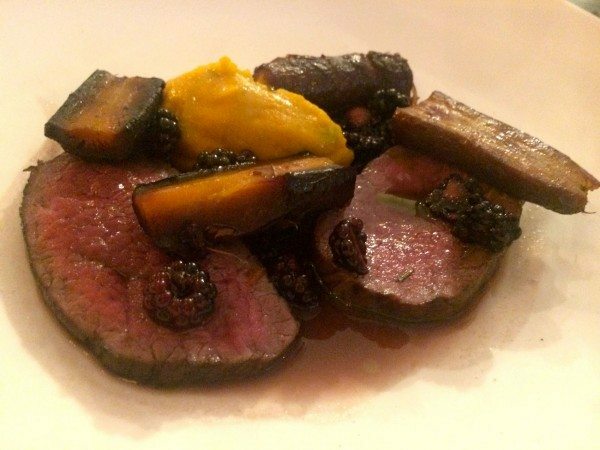 The venison was outstanding; earthy and rich, one of the stars of the show and paired so well with the blackberries, with puréed and roasted carrots as well as roasted heritage purple carrots: a very autumnal, Christmassy meal. The cauliflower was different yet again, with a piquancy from the herb oil and mustard and a sweetness from the puréed red onion and smoky cauli. A very savoury yet sweet mix of flavours that worked well. Lastly, our desserts: a sea buckthorn mousse with celery and rose – light, gentle and lingering in its power, served with a glass of fizzy Old Tree kombucha. Sweetcorn, rye and lemon for the herbivores – a revelation – sweetcorn as a dessert works brilliantly well and I can’t believe I’ve never experienced it before. The puffed rye gave added texture while the lemon came served on top as an ice granita, which was a great palate cleanser. To round off our meal we enjoyed a rich dark molasses chocolate with a small shot of ice-cold coffee before wandering home, content and thrilled by what we’d just had. Douglas has done it again, with a menu that manages to be comforting and nourishing while inspiring and innovative. His creativity knows no bounds – and long may it remain so.